Fragrant Cloud Honeysuckle | Gurney's Seed & Nursery Co.
Clusters of white and magenta flowers envelop the air with soothing sweet fragrance from June through September. Plant near a trellis, arbor or fence and enjoy a beautiful vine that is covered top to bottom with blooms. Grows to 10 ft. tall. Full sun to partial shade. Zones 5-9. Height: 6 to 10 feet. Spacing: 6 - 10 feet. 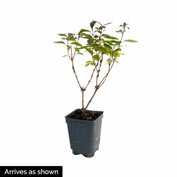 Depth: Plant at same depth as it is in shipping pot. Spread: 6 to 10 feet. Light Required: Full sun to partial shade. More sun will give you more flowers. Color: White with purple blossoms. Foliage: Leaves are purple-green when young and turn green with age. Fruit: Red berries from August to October. Zone: Zones 5 - 9. Flower Form: Small clusters of flowers. Fragrant. 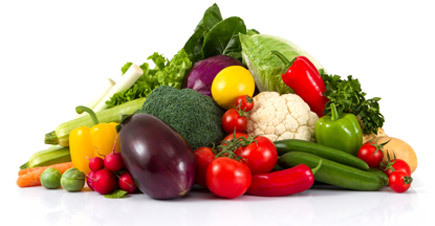 Soil Requirements: Well-drained soil. Tolerant of drought and dry soils once established, but either may reduce flower production and growth. Growth Rate: Medium to fast growth rate. Approximately 3 feet of growth per year. Pruning: Most honeysuckles should be lightly pruned, only when the need arises. They look their best and produce the best flowers when left to grow freely. However, if you want your plant to be really imposing, you should devote the first 1 - 3 years to establishing and forming it. After planting, cut all the stems at 1/3 of the height to promote strong branching at the base. Comments: Very fragrant and floriferous. Attractive light green foliage contrasts wonderfully with the white & purple blooms. Vines are completely covered from top to bottom with blooms. We found this outstanding new Honeysuckle in Poland, in the nursery of Dr. Szczepan Markzynski. And what a find! It produces masses of large blooms over an unusually long period from late Spring into Fall, and the blooms cover the plant all the way to the ground-no naked lower stems on this vine! The fragrance is intense and sweet, a real delight when planted near a porch or window where you can enjoy it in good weather. Hummingbirds adore the sweet nectar of the multitude of ruby and cream blooms, while the bright red berries of late Summer and Fall feed robins and wood thrushes, bluebirds, sparrows and goldfinches. 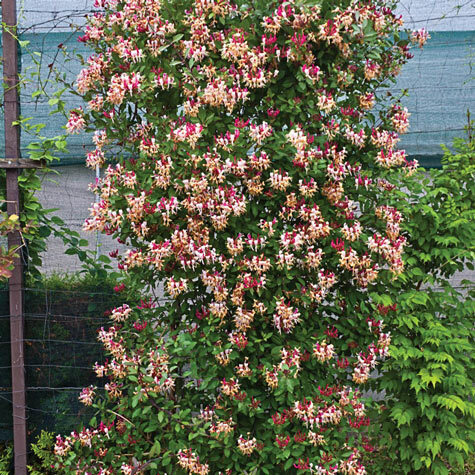 Unlike the sprawling Japanese Honeysuckle, this vine only grows to a compact 6 - 10 feet, depending on the size of it's support. Iit responds well to pruning, so you can keep it a bit smaller if you wish. 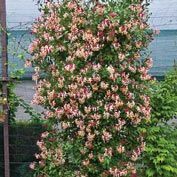 An excellent choice to grow on a fence or trellis, or up the supporting posts of a raised deck where you can sit and enjoy watching hummingbirds sip it's nectar. Once established, this tough vine needs no care, even if you leave for an extended vacation! It will, however, benefit from watering the first season, while it is establishing it's roots. It's official name of 'Chojnow' comes from the old farm in the Polish countryside where Dr. Markzynski discovered it. Cannot ship to AE,AK,GU,HI,PR.